The bacon was taken into custody. . .
HAMILTON — A package of low-sodium bacon triggered the evacuation of House Minority Leader John Boehner’s West Chester office on Monday, Oct. 6, after staff going through the mail became suspicious of oily residue leaking from a package. Worried that the residue was evidence of some sort of attack, staffers contacted the Washington, D.C., office and Capitol police about 3:30 p.m. The four staffers in the West Chester office were evacuated a half-hour later, according to Jessica Towhey, a Boehner spokeswoman. Police, local fire officials and the Butler County hazardous material team were called to the office at 7969 Cincinnati-Dayton Road. After two X-rays of the package were inconclusive, officials took the package out back and opened it, only to find it was bacon. The bacon was taken into custody. Definitely a better headline. But what a waste of bacon! If you are going to send pork to a congressman to make a political statement, at least send something useless, like pork rinds. Then again, it was low-sodium bacon. (yuk!) Come to think of it, I’ve a #10 can of rancid lard I could send to, say, Harry Reid and Nancy Pelosi for that rancid, pork-laden bailout last week. By law, filing and payment deadlines that fall on a Saturday, Sunday or legal holiday are timely satisfied if met on the next business day. Under a federal statute enacted decades ago, holidays observed in the District of Columbia have an impact nationwide, not just in D.C. Under recently enacted city legislation, April 16 is a holiday in the District of Columbia. The IRS recently became aware of the intersection of the national filing day and the local observance of the new Emancipation Day holiday after most forms and publications for the current tax filing season went to print. Individuals in the District of Columbia, as well as in six eastern states, already had an April 17 filing date prior to this announcement because they are served by an IRS processing facility in Massachusetts, where Patriots Day will be observed on April 16. These individuals are still required to file on April 17. “Emancipation Day”. “Patriots Day”. Yeah, that would be too much irony for the annual Fleecing Of The Flock, wouldn’t it? Flock it! I filed my return back in February, did it electronically and had my refund automagically deposited in my bank account a week later. 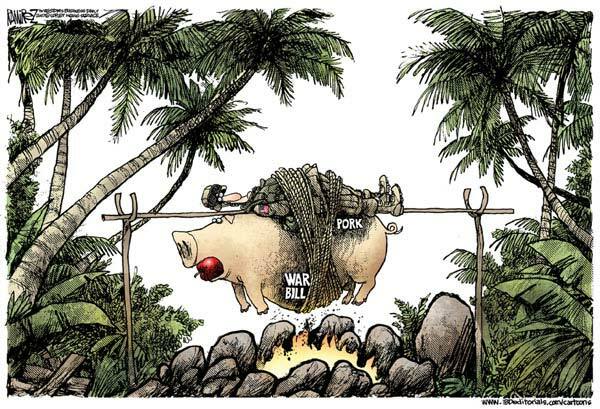 The rest of you nappy-headed taxpayers better get busy writing out checks so the Demoncrat ho’s in Congress can have their pork. Pork: the other green meat. I hate everything about spring, because I’m self-employed. Every year this time I’m a nervous wreck about my taxes. I worry that I’ll owe more than I think I will, and I will. I worry that I’ll not get everything organized and tallied up for my accountant in time, and it’s always close. As the sun shines and the world comes to life, I’ll get calls from beautiful women who want to spend time with me. I’ll be offered box-seat tickets to baseball games, invitations to cookouts, requests to partake in fun and frivolity of every kind. Dissatisfied that the cost and complexity of the income tax was not painful enough --according to the Tax Foundation, Americans wasted 6 billion hours and $260 billion completing returns last year—Congress saw an opportunity to ruin spring, too. That’s why I’ve been shut off from the world. That’s why I’ve been hunkered down with an intensity and focus that would make the Unabomber wince. I have been doing battle with Big Box, you see, trying to make sense of all the receipts, bills, etc. he contains. I’ve been in English-major hell—adding, subtracting, documenting, palpitating. The worst is yet to come. When I finally get everything organized, I’ll forward the details to my accountant. He’ll use them to make complex tax-code calculations. Then he’ll tell me I owe way more than I thought I did. Provided, That the amount provided under this heading is designated as making appropriations for contingency operations directly related to the global war on terrorism, and other unanticipated defense-related operations, pursuant to section 402 of H. Con. Res. 376 (109th Congress), as made applicable to the House of Representatives by section 511(a)(4) of H. Res. 6 (110th Congress). For an additional amount for `Operation and Maintenance, Defense-Wide’, $2,855,993,000, of which not to exceed $300,000,000, to remain available until expended, may be used for payments to reimburse Pakistan, Jordan, and other key cooperating nations, for logistical, military, and other support provided, or to be provided, to United States military operations, notwithstanding any other provision of law. In addition to the funds provided elsewhere in this Act, $25,000,000 is appropriated to the Secretary of Agriculture, to remain available through September 30, 2008, to resume the 2005 Hurricanes Livestock Indemnity Program. In addition to the funds provided elsewhere in the Act, $15,000,000 is appropriated to the Secretary of Agriculture, to remain available through September 30, 2008, for the purpose of providing assistance, in connection with the provision of emergency financial assistance for losses for 2005 or 2006 crops. In addition to the funds provided elsewhere in this Act, $100,000,000 is appropriated to the Secretary of Agriculture, to remain available through September 30, 2008, to resume the 2005 Hurricanes Citrus Program. For an additional amount for `Operations, Research, and Facilities’ for necessary expenses related to the consequences of Hurricane Katrina on the shrimp and menhaden fishing industries, $120,000,000. For an additional amount for `Flood Control and Coastal Emergencies’, as authorized by section 5 of the Act of August 18, 1941 (33 U.S.C. 701n), for necessary expenses related to the consequences of Hurricane Katrina, $1,300,000,000. 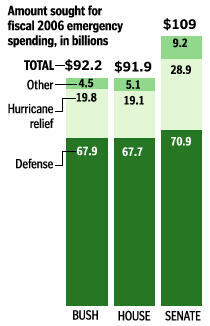 For an additional amount for `Disaster Relief’, $4,310,000,000. For carrying out activities authorized by subpart 1 of part D of title V of the Elementary and Secondary Education Act of 1965, $30,000,000. There are hereby appropriated to the Secretary of Agriculture such sums as are necessary, to remain available until expended, to make emergency financial assistance available to producers on a farm that incurred qualifying quantity or quality losses for the 2005 or 2006 crop, or for the 2007 crop. There are hereby appropriated to the Secretary of Agriculture such sums as are necessary, to remain available until expended, to carry out the livestock compensation program established under subpart B of part 1416 of title 7, Code of Federal Regulations, as announced by the Secretary on February 12, 2007 (72 Fed. Reg. 6443), to provide compensation for livestock losses during calendar years 2005 and 2006. There is hereby appropriated to the Secretary of Agriculture $25,000,000, to remain available until expended, to make payments to growers and first handlers, as defined by the Secretary, of fresh spinach that were unable to market spinach crops as a result of the Food and Drug Administration Public Health Advisory issued on September 14, 2006. MILK INCOME LOSS CONTRACT PROGRAM. For an additional amount for `Wildland Fire Management’, $100,000,000. For an additional amount for `Surveys, Investigations, and Research’ for the detection of highly pathogenic avian influenza in wild birds, including the investigation of morbidity and mortality events, targeted surveillance in live wild birds, and targeted surveillance in hunter-taken birds, $5,270,000. For an additional amount to make payments under section 2604(a)-(d) of the Low-Income Home Energy Assistance Act of 1981 (42 U.S.C. 8623(a)-(d)), $200,000,000. For an additional amount for `Public Health and Social Services Emergency Fund’ to prepare for and respond to an influenza pandemic, $969,650,000. I bet some of you out there actually believed the Democrats were going to take control in Washington and clean up all that corruption and payoffs to Senators and Representatives, didn’t you? If so you are not only incredibly stupid but also exceedingly gullible. Take Senator Diane Feinstein (D-CA) for instance. Did you know that for years she has chaired the Military Construction Appropriations subcommittee which has surprisingly paid out billions in military contracts to two companies owned by ... you guessed it ... her husband. Each year, MILCON’s members decide which military construction projects will be funded from a roster proposed by the Department of Defense. Contracts to build these specific projects are subsequently awarded to such major defense contractors as Halliburton, Fluor, Parsons, Louis Berger, URS Corporation and Perini Corporation. 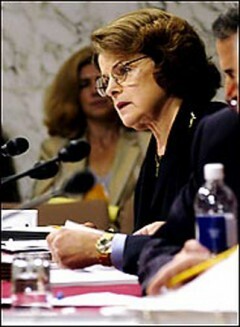 From 1997 through the end of 2005, with Feinstein’s knowledge, Blum was a majority owner of both URS Corp. and Perini Corp. In her annual Public Financial Disclosure Reports, Feinstein records a sizeable family income from large investments in Perini, which is based in Framingham, Mass., and in URS, headquartered in San Francisco. But she has not publicly acknowledged the conflict of interest between her job as a congressional appropriator and her husband’s longtime control of Perini and URS--and that omission has called her ethical standards into question, say the experts. Wanna earn some quick, easy money? It’s simple. Just talk to your Congress-critter and convince him or her to post their work schedule on the internet so everyone can see just how hard they are working in DC. Or not. You can earn $1,000 for each one you “sign up”. Who are our lawmakers meeting with? Lobbyists? Constituents? What do they do with their time? Members of Congress work for us, and we should know what they do every day. That’s a pretty straightforward proposition, and we bet you agree. So Sunlight is launching a campaign, at http://www.punchclockcampaign.com, to get Members of Congress to agree to post their daily calendars on the Internet. But we need your help and creativity to make that happen. We’ll give you $1,000 for each Member of Congress, and $250 for each candidate, who you get to agree to do this, beginning with the next Congress. We’re not kidding. Consider this a fee for your work. We’re calling this the Punch Clock Campaign because almost all of us have to turn in timesheets or punch a clock to get our paychecks. This Congress has put in less work days than any other Congress since 1948. What are they doing when they are not in legislative session? If we are going to change the nature of the relationship between lawmakers and citizens, it has to include a greater understanding of what Members of Congress do with their time. Check out our site, ask questions, share it with your friends, and enjoy the hunt for the elusive time of our Congress! All politics is local, Tip O’Neill famously said, and it surely doesn’t get any more local than when a 6,000-pound slab from a project championed by the late House speaker falls on a 38-year-old newlywed from Jamaica Plain, crushing her to death as her husband drives her to the airport. O’Neill died in 1994, but the political culture he epitomized is alive and well and enshrined in the Big Dig, a slough of corruption, callousness, and cover-ups that had become a synonym for government mismanagement long before it killed Milena Del Valle on July 10. It would be going too far to link O’Neill to the incompetent workmanship and negligent oversight that led to the collapse of a 3-ton ceiling panel in the Interstate 90 connector just as the Del Valles drove beneath it last week. But the culture that he embodied is still solidly in place. Only one month earlier the lords and ladies of Bay State politics had gathered to christen the longest section of the Big Dig as the Thomas P. “Tip” O’Neill Jr. Tunnel and proclaim the immense—and immensely expensive—highway project his triumphant legacy. “That project could never be complete until it bears the name of the person who made it all possible,” gushed US Senator Ted Kennedy. “So let us celebrate his great legacy today . . . and remember that our job in public life is to improve the lives of others.” Valle’s life was not improved by this troubled project. It was ended by it. The fact is, only someone marinated in the political culture that produced the Big Dig could have said something so clueless. Granted, Kerry and his fellow preening pols didn’t know on June 5 that part of the connector tunnel was soon to come crashing down on an innocent victim. But it wasn’t exactly a secret that the project was a bloated catastrophe, vastly over-budget and marred by leaks, delays, and falling debris. For years news stories, outside audits, and leaked internal memos had been documenting a shocking history of failures and errors. Just a few weeks earlier, six employees of Aggregate Industries, the Big Dig’s largest vendor of concrete, had been arrested for allegedly falsifying records to disguise the poor quality of the concrete supplied. Long before the dedication ceremony in June, the Big Dig had come to stink of cronyism, corner-cutting, and deceit. But that didn’t stop Kerry, et al., from singing hosannas to O’Neill and pooh-poohing the critics’ warnings. Only now that a woman is dead is Kerry suddenly talking about how he, like “every citizen in this state, wants accountability,” and how there was “clearly a failure with respect to design and certain levels of oversight.” So good of him to finally notice. The Big Dig is indeed a monument to O’Neill. It captures perfectly the costly big-government sloppiness for which he was the poster child. Only in the public sector, where market discipline is nonexistent and financial losses are the taxpayer’s problem, would such mismanagement be tolerated for so long. Only in the public sector, where political considerations far outweigh the bottom line, and where consumer satisfaction carries little weight, is such shoddiness and lack of oversight routine. In the private sector, incompetent performance generally means lost business, reduced earnings, or even bankruptcy. Only in the public sector—under Democrats and Republicans both—are negligence and failure commonly rewarded with ever-increasing budgets. “Giving money and power to government,” P.J. O’Rourke once observed, “is like giving whiskey and car keys to teenage boys.” In both cases, the results can be lethal. Jeff Jacoby’s e-mail address is jacoby@globe.com. 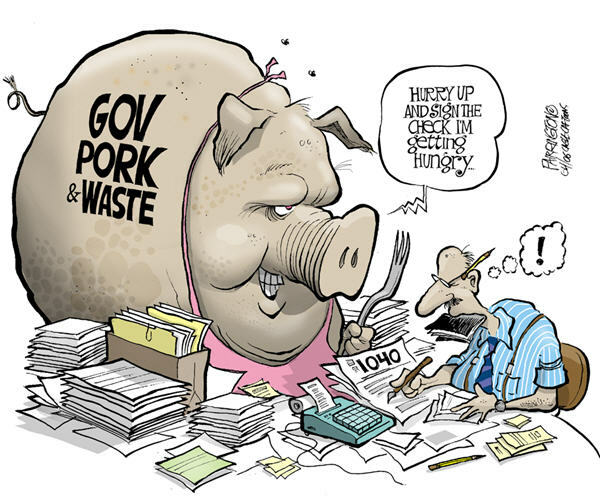 When it comes to pork in the budget, the US Senate is part of the problem not the solution. Once again, this dishonorable bunch of spendthrifts went out of their way to carve out a little pork for a few pet projects while attempting to provide emergency funding for the war and hurricane relief. Where is the line item veto when you really need it? (WASHINGTON POST)—The Senate ignored President Bush’s veto threat yesterday and easily passed a $109 billion emergency spending bill for war and hurricane recovery costs that also brimmed with favors for farmers, the fishing industry, and the states of Hawaii and Rhode Island. The two-week debate that preceded yesterday’s 77 to 21 final vote was marked by an election-year surge in targeted spending on behalf of constituents and special interests, despite repeated warnings by fiscal conservatives about a swollen budget deficit. If the threats hold, senators will have to accept a final bill that is nearly $15 billion less than the legislation approved yesterday. The House package, which passed March 16, came in slightly below Bush’s original $92.2 billion request, at $91.9 billion. The Senate bill arrived on the floor last week at $106.5 billion but grew through a series of amendments. Bush did sign off on one additional measure, $2.3 billion for pandemic flu preparations. The bill’s original intent was to provide funding for the wars in Iraq and Afghanistan and to help Mississippi and Louisiana rebuild after Hurricane Katrina. Ever since the Iraq invasion in March 2003, the administration has insisted on paying war-related expenses through ad hoc supplemental spending bills. It contends that the conflicts are temporary and that military costs cannot be anticipated well enough to be included in the regular budget process. And just who were the biggest piggies in this porkfest? If you aren’t mad yet about wasteful spending in Washington, be prepared. This one will knock your socks off, kiddies. It seems there has been some diddling with the federal relief funds for 9/11 victims and somehow, thanks to bureaucrats at SBA who deny all knowledge and bankers who refuse to reveal details, we have doughnut shops in Georgia getting loans at sweet interest rates to “help them recover from 9/11”. I say we string all the varmints up from the nearest tree and march on Washington with flaming torches and pitchforks. Are ye with me, lads ...? More than 25 Dunkin’ Donuts franchises far from New York City were granted federally guaranteed loans at sweet interest rates under a program that was supposed to help businesses recover from 9/11, The Post has learned. The franchises, located in distant places such as Ohio, Georgia and Vermont, got loans totaling $20 million. The Small Business Administration’s inspector general is probing whether banks pushed the loans to make big profits. 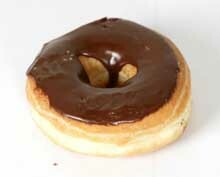 Why so many Dunkin’ Donut shops got the loans — which were provided to businesses ranging from hotels to muffler shops — is one of the mysteries surrounding the troubled program. Taxpayers aren’t the only ones who got dunked. Dunkin’ Donuts franchise owners around the country say they had no idea they were benefiting from a 9/11 program, called STAR because it was part of the Supplemental Terrorist Relief Act. “We just took the loan to remodel the place,” said Mnosh Vsava, the manager of a Dunkin’ Donuts in Berwick, Pa., who got an $870,000 loan from New York City-based CIT Small Business Lending Corp. “It wasn’t 9/11 things or anything. No one ever explained nothing,” said Bobby Patel, who got a $558,000 loan for his Willoughby, Ohio, franchise. Bruce Herold, the loan officer from Bank One (now JP Morgan Chase & Co.) who approved Patel’s loan, claimed he didn’t know his bank issued a 9/11 loan. “I have never done a STAR loan here that I knew of,” he said. “This was just an SBA deal.” Yet businesses are supposed to prove they were “adversely affected” by the attacks to get the loans, and banks are required to keep the information on file. Herold said he couldn’t provide such documents because he wasn’t aware he had made a STAR loan. Jeff Gentile, who owns a franchise in Cabot, Pa., said it was “silly” that he got a $120,000 loan under the program. Banks had an incentive to hype the loans because the government reduced the traditional fee — saving some of the biggest lenders millions. The federal guarantee shields the banks from losses. Rival chain Krispy Kreme didn’t get any loans under the program. “It doesn’t make sense to me that people with a Dunkin’ Donuts in Kansas would say, ‘Hey, I can get some 9/11 money,’ “ said Sen. Hillary Rodham Clinton (D-N.Y.), suggesting banks or the administration pushed the loans. Dunkin’ Donuts, owned by French liquor distributor Pernod Ricard, is close to being sold for $2 billion and reported more than $3 billion in revenues last year. Dunkin’ Donuts and CIT each denied pushing the STAR loans, even though CIT was the program’s top lender, giving out $422 million, including loans to almost every doughnut shop. “It’s not something that we promote or advocated,” said Andrew Mastrangelo, spokesman for Massachusetts-based Dunkin’ Brands Inc.